Hello again! I’ve just reached the end of my seventh week here in Chicago, which means after just one more week, it’ll be halfway through the semester, which is crazy!! I haven’t been able to decide yet if it feels like I’ve been here longer or shorter than seven weeks. It seems like forever ago that I was at home with my family, but to think about how quickly the rest of the semester is going to fly by leaves me wondering where the time has gone. Since I wrote my first blog post, the list of things I’ve done has grown immensely. Weekends are the only chance I have to get out and do things in the city, but they’re also the only time I can recharge after my long weeks of working. Because of this, I always try to shoot for having the perfect mix of relaxation and exploration on the weekends. 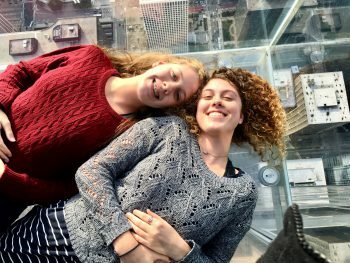 I let myself sleep in and watch plenty of movies, but I also make sure to go out and do fun things with my Chicago Semester friends. The past several weeks, I’ve gone on the Chicago’s First Lady Architecture Boat Tour, tried my first Chicago dog at Portillo’s, explored the Loop and Chicago’s Theater District, played the piano in a practice room at the Chicago Public Library, and tried a bunch of the best pizza places around the city (if you ask me, Gino’s East is the best)! I was also so blessed to have my mom, sister, and two aunts come visit me this weekend! We did so many things that we weren’t left with one minute of spare time…it was very draining, but so much fun. 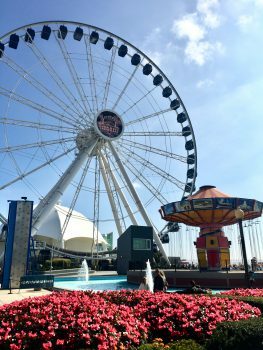 Aside from doing some of the things I mentioned in my last blog post with them, we went to the Sky Deck at the top of Willis Tower and rode the Centennial Wheel at Navy Pier, which were both a blast! Although I’ve gotten to check many things off my Chicago bucket list in the past several weeks, exploring the city is not what I’ve been doing with most of my time. My weekdays feel pretty repetitive most of the time thanks to my 9-to-5 schedule…I wake up, go to my internship at Open Books, come home, eat dinner, watch Netflix, and go to sleep, just to do it all over again the next day. Thankfully, I’m enjoying my internship a lot. For most of the semester, I’ve been doing prep-work to get ready for our ReadThenWrite program, which includes putting together teacher, coach, and student materials and practicing editing students’ work. The most difficult thing I’ve been having to overcome about my internship has been keeping myself motivated at work since my workload hasn’t been that heavy yet, but it’s also been difficult finding the energy to keep going all day everyday. Through this experience, I’m realizing how exhausting it is to work full-time as a professional in the real world. On the bright side, this past Thursday I was able to attend my first couple of classes as a coach in the ReadThenWrite program at one of the schools Open Books is partnered with. 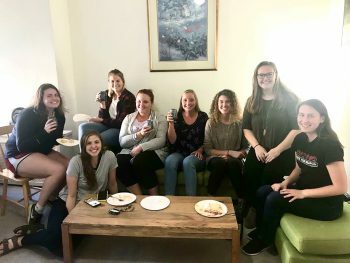 I was unsure about how much I’d like it, seeing as how I’m not going into teaching after I graduate, but it was so enjoyable getting to interact directly with the students and getting to know them. I’m looking forward to the rest of the semester interacting with them and teaching them how to become better readers and writers on Mondays and Thursdays of every week!